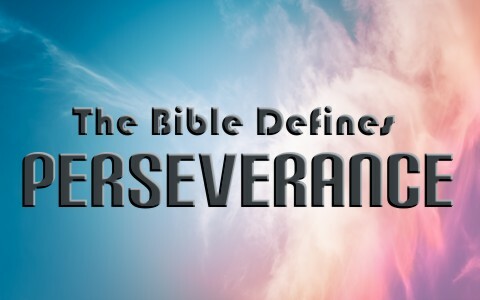 How Does The Bible Define Perseverance? Outside of Calvinist theological circles, the word perseverance is not often used by many Christians. As was written in the article, “What Does Perseverance Of The Saints Mean?”, the perseverance of the saints theology is one of five cardinal doctrines or points of Calvinism. For the Calvinist, it is the demonstration of a person’s election by God to salvation. For those of Arminian theology, it is the continual seeking and persevering in holiness so that they may not lose their salvation. Unfortunately, both tie man made works to having a more important role in salvation than what is defined in Scripture. For this reason, more focus on the role of perseverance is in order. To persevere means that one may “continue in a course of action even in the face of difficulty or with little or no prospect of success (1).” It often denotes an action of experiencing victory in the continuance of one’s unceasing efforts no matter what the odds or actual outcome. Perseverance is often confused with the term preservation. Preservation means “the action of preserving something or the state of being preserved, especially to a specified degree” (2). Therefore, preservation of the saints is different from perseverance of the saints. A simple statement illustrating the difference would be if one were to describe the process of canning food at home, which is a labor-intensive process. They might say, “I will persevere in getting all these fruits and vegetables prepared and processed in Mason jars so that the fruits and vegetables are preserved until the day I want to eat them. The same could be said of believers, “I will persevere by the strength of the Holy Spirit in serving the Lord because He has preserved, or sealed me, until the day of redemption (Ephesians 4:30; 2 Thessalonians 2:14-15). What part does perseverance have in the life of the believer? This is an important distinction to understand because our works merit nothing when it comes to our salvation (Isaiah 64:6; Matthew 7:21-22; Ephesians 2:8-9; Titus 3:5). However, we are called to continue, or persevere, in good works because we are saved (Psalms 102:18-27; John 15:9-17; 2 Timothy 3:12-14; 1 Corinthians 16:13-18; Galatians 5:1-13). Sadly, many people, like the Judaizers in Galatia do not believe this. Instead, they believe that someone who is saved must continue to keep the law (Acts 15:1-5; Galatians 1:6-9; Galatians 2:14). If we think about it, to believe as the Judaizers did, it would be saying that we got saved by God’s grace through faith, but in order to keep saved, we must do works? Heaven forbid! If we are not good enough to merit our salvation by works, what makes us think we are good enough to keep our salvation by works? Likewise, if we can lose salvation because of sin, then how do we get it back? I ask this question all the time to those who claim this theology. I usually ask them what would make them lose their salvation and their response is living a sinful lifestyle. Then I follow up by asking them how they get their salvation back and they reply that the person must stop living a sinful lifestyle. So, you get saved the first time by faith and other times by works? You can see where this creates a terrifying reality for the believer in that they can never know where they stand with God. Likewise, when they doubt their salvation they cannot have the assurance of knowing they are saved and step out in confidence in serving the Lord out of love (1 John 5:10-15). Finally, when we hold to this belief, we are trivializing the severity of sin and creating a list of sins that cause us to lose blessings and sins that cause us to lose our salvation. It denies the very fact that ALL sin results in death (Romans 6:23). It also denies the fact that anything not done of faith is sin (Romans 14:17-23). Without this reality, we would have to ask how many times did the Apostle Paul lose and regain his salvation every day (Romans 7:7-24)? Thankfully, God has provided to us the ministry of reconciliation (1 John 1:8-10). We can be assured that Christ died on the cross for our sins and His provision for forgiveness gives us the confidence to be restored and persevere no matter when we have made bad choices. Thanks be to God for saving us and keeping us so that we are enabled to persevere (John 10:28-29). When defining the word perseverance using the Bible we must be careful not to confuse it with the concept of preservation. The Bible clearly teaches that believers are “preserved” or sealed until the day of redemption. However, believers are called to continue, or “persevere”, in good works because they are saved and not as a means of salvation. Therefore believers cannot lose their salvation and this is only by the power of the Holy Spirit (Ephesians 1:13-14; Ephesians 4:30). God gave us the ministry of reconciliation (1 John 1:8-10). Because of Christ’s death on the cross for our sins and His provision for forgiveness we have the confidence to be restored and “persevere” no matter when we have made bad choices. According to the Bible He keeps us and enables us to “persevere” (John 10:28-29). Resources – Scripture quotations are from The Holy Bible, King James Version. (1) Google. (2014). “Persevere”. Retrieved from Google, https://www.google.com/?gws_rd=ssl#q=persevere. (2) Google. (2014). “Preservation”. Retrieved from Google, https://www.google.com/?gws_rd=ssl#q=preservation.